The fat and calories have been lowered by substituting applesauce for some of the oil, using less butter and sugar, fewer eggs, and substituting light for regular cream cheese. For Cake: Coat 3 (9-inch) round cake pans with cooking spray; sprinkle 2 teaspoons flour evenly into pans, shaking to coat. Combine remaining 3 cups flour and next 4 ingredients in a large bowl. Stir together eggs, applesauce, and oil; add to flour mixture, stirring just until dry ingredients are moistened. (Do not beat.) Stir in mashed banana, vanilla extract, and pineapple. Pour batter evenly into prepared pans. Bake in a preheated oven at 350°F (175°C) for 23 to 25 minutes or until a wooden pick inserted in center comes out clean. Cool layers in pans on wire racks 10 minutes. Remove layers from pans; cool completely on wire racks. 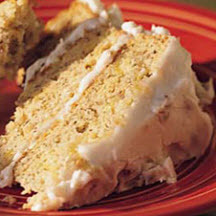 For Cream Cheese Frosting: Beat cream cheese and butter at high speed with an electric mixer until creamy. Gradually add powdered sugar, beating at low speed just until smooth. Stir in vanilla and pecans. Nutritional Information Per Serving (1/20 of recipe): Calories 407 (21% from fat); Fat 9.5 g (sat 2.9 g, mono 3.2 g, poly 2.1 g); Protein 4.6 g; Carbohydrates 78 g; Fiber 1.7 g; Cholesterol 33 mg; Iron 1.3 mg; Sodium 184 mg; Calcium 31 mg.